The Yucatan Peninsula is in the south-eastern Mexico, separating the Caribbean Sea from the Gulf of Mexico with the northern coastline towards the Yucatan Channel. The peninsula is situated towards the east of the Isthmus of Tehuantepec with the north western geographic partition which separates the region of Central America from the rest of North America. It comprises of the Mexican states of Yucatan, Campeche to the south and Quintana Roo, home of Cancun and Cozumel, the northern region of the nation of Belize and northern Guatemala, El Peten Department. Besides this, Yucatan is also a home to the Chicxulub Crater and according to geologist this crater dates back to around 65 million years from Earth’s collision with a meteorite and the extinction of the dinosaurs. It is also one of the centres of the Pre Colombian Maya civilization where the Maya people continue to form a significant part of the state’s population. Towards the late 1800s, a plant called henequen which is known for its strong fibres and turned into twine, became quite popular as the green gold of Yucatan and the sale of sisal rope which was named after the port Sisal from where the rope were shipped all across the globe, was the outcome of the wealth of Yucatan. Yucatan thereafter became one of Mexico’s richest states due to Henequen and turned Merida into a city with many millionaires than any other city all over the world at the turn of the 20th century. 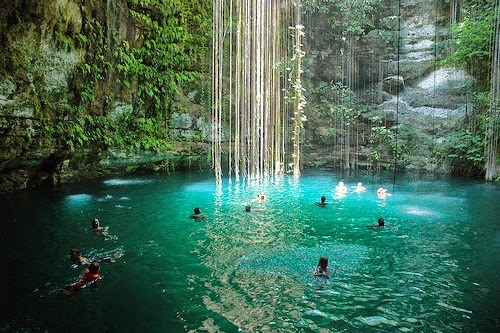 Yucatan is a region of friendly and peaceful people and an awesome place to explore Maya culture with beautiful sandy beaches, ancient Maya archaeological sites, underground rivers and cenotes. The people of this region speak Maya and Spanish, while English and German are commonly spoken at tourist sites. Yucatan is a wonderful place for those interested in bird watching. Merida the capital and largest city in Yucatan State is the cultural as well as the financial capital with modern, cosmopolitan city along with museums, restaurants, art galleries, boutiques and shops. Being a major centre of commerce, Merida Yucatan is also considered as the crossroad of the region and one of the best places to explore the Mayan heritage. Merida got its nickname, La Cludad Blance or the White City, due to the predominance of white limestone which have been used in building material. Merida’s long tradition carnival usually takes place in a family environment for eight days with several cultural and entertainment functions taking place, like the coronation of the king and queen and the burning of the bad mood which is held in the main square of the city. It starts with the reading of the conviction of the bad mood which is read out loud and setting of fire to the figure representing it, followed with display of colourful fireworks. Amidst a hilarious battle of flowers, the festival goes on with endless theme parades, which features costumes, bachata, floats, together with folk dances, dancing to the beat of mambo, cumbia and salsa. The carnival ends with the burial of Juan Carnaval or Carnival John, with a will that is read and the widows mourns his death which is one of the most crowded ceremonies of the festival.